The village of Méan is located north-east of the town of Ciney on the N63. 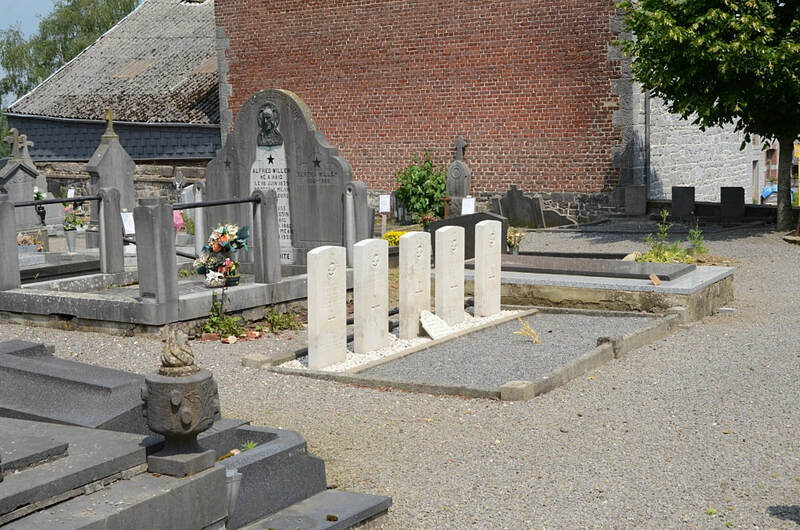 From the motorway E42 which runs between Mons and Liege turn off at junction 7 onto the N64 direction Huy. 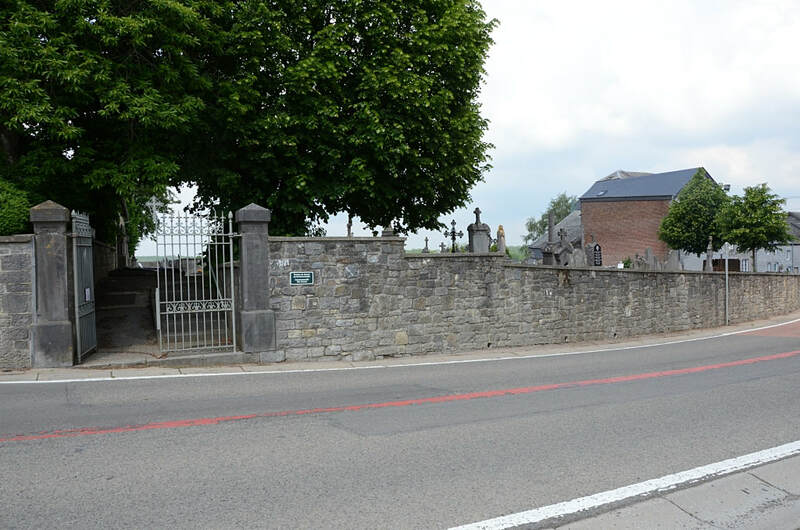 Follow the N64 to Huy then join the N66 direction Tinlot, in Tinlot turn right onto the N63 direction Marche-en-Famenne. Follow the N63 to the junction with the N938 and turn right here direction Mean, the church is a short way along on the left and the cemetery is on the right opposite the church. 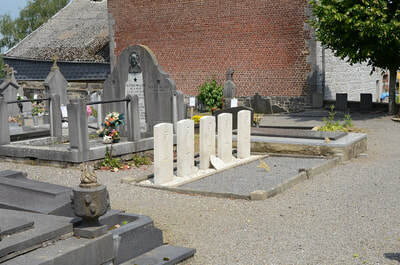 The graves are located along the right hand path from the entrance on the left. 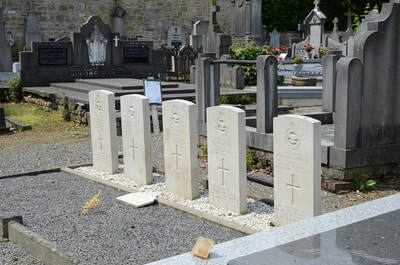 Méan Communal Cemetery contains the graves of five airmen of the Second World War. 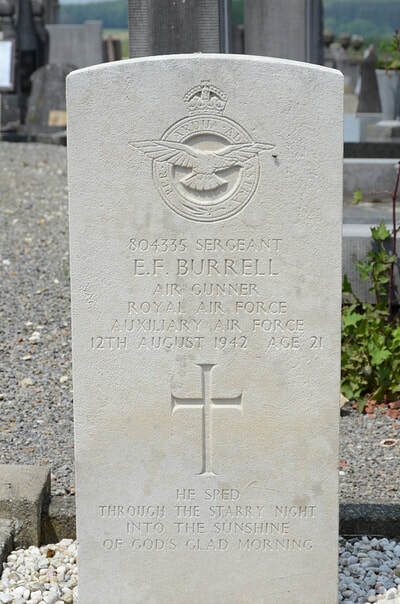 804355 Sergeant Edward Frederick Burrell, Air Gunner in 78 Squadron, Royal Air Force, (Auxiliary Air Force), died 12th August 1942, aged 21. 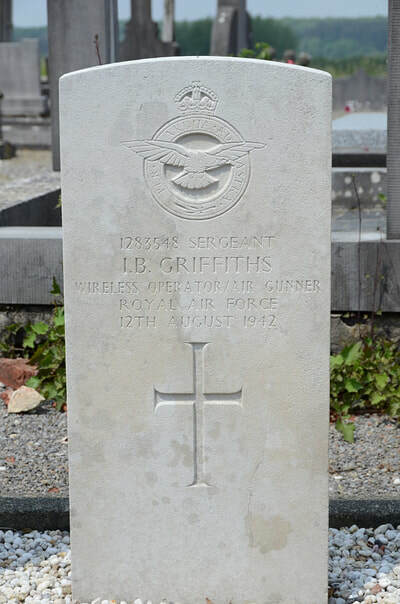 Son of Albert Charles and Rebecca Harper Burrell; husband of May Emily Violet Burrell, of Forest Gate, Essex. 1283548 Sergeant Ivor Brinley Griffiths, Wireless Operator/Air Gunner in 78 Squadron, Royal Air Force Volunteer Reserve, died 12th August 1942. 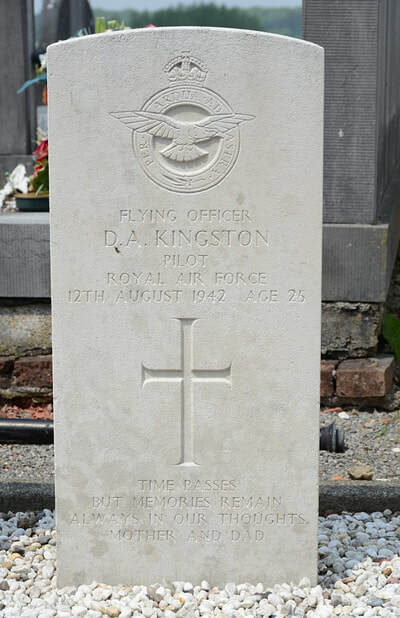 77393 Flying Officer Donald Arthur Kingston, Pilot in 78 Squadron, Royal Air Force Volunteer Reserve, died 12th August 1942, aged 25. Son of Wing Cdr. William Arthur Kingston, formerly R.A.F., and Lillian Charlotte Kingston, of Hillingdon, Middlesex. 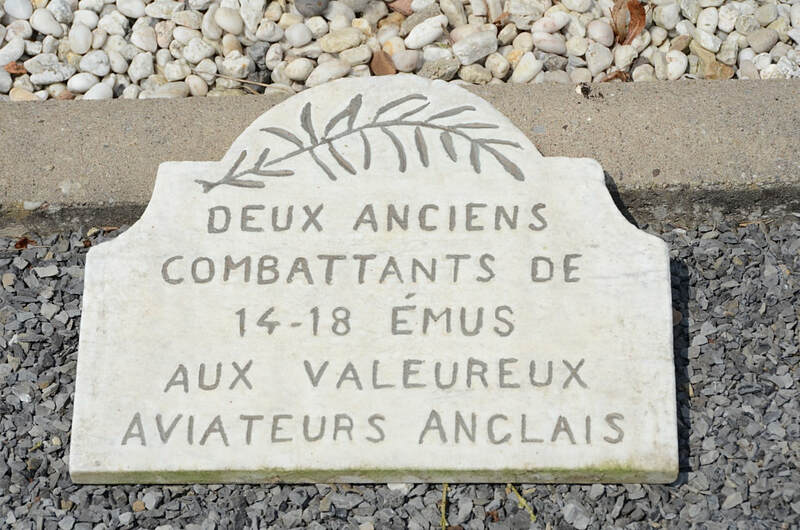 115987 Pilot Officer Graham Watson MacAllister, Pilot in 78 Squadron, Royal Air Force Volunteer Reserve, died 12th August 1942, aged 30. 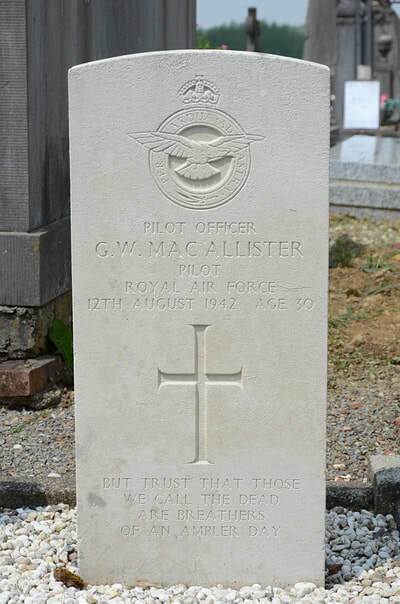 Son of James Joseph Bell Macallister and Grace Macallister. 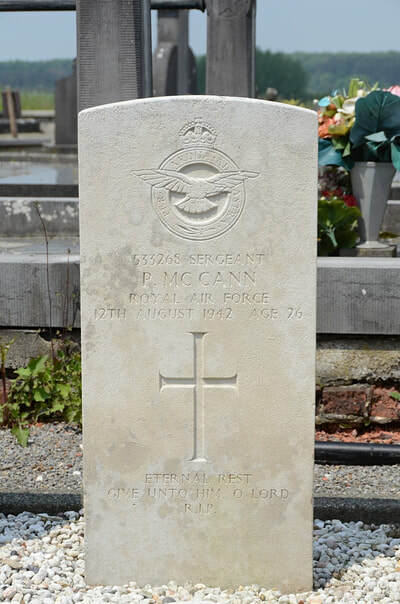 533268 Sergeant Patrick McCann, 78 Squadron, Royal Air Force, died 12th August 1942. Son of Mr. and Mrs. Patrick McCann; husband of Elizabeth McCann.